Someone who venerates plot to the extent I do should not have enjoyed this book as much as I did. There’s a Nancy Drew-esque dollop of convenience at every turn, and a series of coincidences and sudden realisations that just happen to tie these actions together far more tightly than seems possible at first glance…and I should abominate such quick answers. But, holy hell, it’s also superbly written, and rich in the pulp sensibilities that resulted in me crowning Jim Thompson one of the four most important male crime writers of all time. Classicaly constructed it isn’t, but gloriously entertaining it certainly is. “Yeh,” said Peru, who had few words. The Captain was nothing to me, of course, but given an audience Jobson cared little for that. He commenced with the first coming of the Captain to Middlehaven which, as it antedated Jobson’s own coming by an indeterminate period, was referred to as “some time back yonder”. The impossible murder that crops up at the two-thirds stage concerns a man drowned on dry land while alone in a bolted, locked, and otherwise sealed cabin, and brings the wonderful Detective Veen into the action. GAD needs more investigators who, upon sitting down to hear the witnesses give their version of events, open with the line “Fire away. Let’s have the whole thing over with, the sum total of your faulty memories, unjustified inferences, and baseless conjectures”. The solution to that crime, incidentally, isn’t among the strongest you’ll encounter — relying as it does on a principle I personally loathe in my detection — but it is very much the glue at the centre of all the things that have happened to that point, and for its deployment in that way it works note-perfectly. See, even a second-rate impossibility hasn’t dissuaded me from my joy here; it must be love! Let the unconvinced be referred to the perfect note this ends on if you need proof of the complexity of what Markham has written here. Every aspect of the plot — every single one — ties in somewhere else, to become a repeating motif or a callback, or to justify an action. The loosey-goosey structure will not be to everyone’s taste, but I would snap up another Markham right now. The cover may be among Gavin L. O’Keefe’s oddest, but the book is one of Ramble House’s unknown pleasures. If you can stand a little experimentation, snap it up at the earliest opportunity. 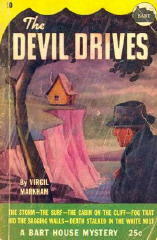 Mike Grost @ The GADetection Wiki: The Devil Drives also completely fails to observe the conventions of the Golden Age novel, with an opening murder, a detective, and a closed circle of suspects. Indeed, for its first half no murder is committed at all; the hero instead tries to track down a secret which seems like a plot device out of a romantic melodrama … [The locked room puzzle] is a new wrinkle on the locked room story. I don’t know if it is fair play; surely the police would have figured it out after investigation. Still, it is something that I haven’t seen elsewhere, and is a mildly interesting idea. If The Devil Drives were a short story concentrating on its locked room puzzle, it would be an anthology standard. Unfortunately, this plot is embedded in a not very good novel, one that meanders all over the place without much point or interest. The book cannot be recommended as a whole. For the Follow the Clues Mystery Challenge, this links to Dead Man Control from last week because both can be found on the Ronald Lacourbe 99 Novels for a Locked Room Library list. For the same reason, on my Just the Facts Golden Age Bingo card this fulfils the category It made a “best of” list. Aha! I was right…but not exactly for the reasons I predicted. I’m sure someone will chime in with an “If you like this, then you’ll love” kind of recommendation. And so I’ll beat TomCat to that. DEATH AT DUSK is one of Markham’s earliest books — I believe it’s his first detective novel. I think you’d enjoy that a lot. That one is drenched in eccentric prose (“wildly exuberant” is how Martin Edwards described it) not at all the kind of pulpy, breezy feel of this one. It’s supposed to be in imitation of an old Gothic novel. After THE DEVIL DRIVES I think it’s the easiest Markham mystery novel to find. His later books are not so great like INSPECTOR RUSBY’S FINALE and SHOCK! But nearly all of his books are very hard to find and terribly expensive when they show up so I don’t imagine you’ll be able to feed your Markham craving any time soon. Uh…make that DEATH IN THE DUSK. Thanks, John, I did have Death in the Dusk pegged, so it’s good to know that it’s one to keep an eye out for having enjoyed TDD. Certainly, in spite of its relative ease in acquisition, it doesn’t appear to be in any of the places I’m looking, but I’m hardly short of books (I have bought more than I’ve read so far this year…I will never get this TBR into manageable shape ever again) and more than content to wait. I have Death In The Dusk. It is 390 pages long ! I read it long, long, long back and I remember liking it then. A late response, I know. Anyway, Death in the Dusk is something else altogether. A bizarre, blood-soaked fairy tale, written as an eccentric detective story, which should be read and soaked up at your leisure. When you have nothing else on your mind. And even then, it’s a book that’s hard to warm to and can only really be appreciated for what it is trying to do and how. So keep that in mind when you get around to it. I am….fascinated. I’ll keep an eye outbut I don’t expect to stumble over it any time soon. Thanks for the primer. Regarding your twitter feed – did you just pick up those two Crofts books and that Dickson? I have the exact same editions of all three of those books. As to the Crofts and the Dickson — yup, got ’em in the post today; given their relative scarcity I thought I better buy them up when the opportunity presented itself (Kate, not being a Crofts fan, alerted me to those ones). They’re in pretty gorgeous conditons, considering their age, so I’m rather pleased to have them. Actually, I was wrong – my Crofts are Penguins, but they are the 1960-1970’s editions that have illustrations on the cover. I picked up Golden Ashes, Death of a Train, The Pit Prop Syndicate, The Sea Mystery, The 12:30 From Croydon, and Inspector French’s Greatest Case – all for about $15 total. I’m leaning towards starting with The Sea Mystery, based on your review. I figure I want to start with a really strong title to assure I get my interest up, rather than taking my chances with something more obscure. And…. I just picked up your “choice of covers” for The Devil Drives for super cheap. Darn it! I was finished buying books for this month! I’ve been trying to limit myself to one purchase a month (although that could be a pack of books). So far this month I’ve “restrained” myself to The Hogs Back Mystery and a seven pack of Michael Gilbert. Ok, so having finally read this (and enjoying the hell out of it), I can’t think for the life of me why this cover was chosen. There are two characters in the book with red hair, but I don’t quite get why they would feature on the cover, nor why the picture is done in that double exposure style. Or, for that matter, why the hair style is so strange. I don’t recall either of the characters being described as having the world’s worst hair cut. Yeah, sorry, in the intervening 8 months I have forgotten my semi-justification for the cover art. One of the characters had red hair, I remember that much, so perhaps that’s what I was going for? Note to self: be less vague; sometimes people remember when you say things. Delighted you enjoyed this, however; it’s a weird book, but that in no way counts against it. Given that Ramble House are reprinting new titles at quite a rate again now, I wonder if they’ll ever get to anything else by Markham. I’d love to read more of his work. My review of La Toile De Penelope by Paul Halter is now available at Goodreads. That is certainly up there in the least-appealing art I’ve ever seen. I feel thoroughly loathed by that cover. That darned contagious enthusiasm of your review does mean that I’ll have to put this on a someday-maybe list, though. Oh, I’m certainly tempted by this as it sounds quite entertaining. I couldn’t face any book with that cover though – that is every kind of ugly and kind of disturbing. Colin, you need to get in touch with Ben in that case — he has a rich source of every kind of book ever, it would seem, and found the best cover of this ever for zero money in zero time!